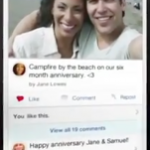 From the first kiss to will you marry me and beyond, our friends at Zoosk are encouraging their success couples to share their romantic milestones and hang around once their relationship has become official. Redefining themselves as ?the romantic network,? they?ve announced a new feature called ?Couples Profiles,? where happy couples can create a joint profile to highlight their romantic journey. Zoosk co-founder Shayan Zadeh and a friend of Cyber-Dating Expert tells us, ?Zoosk started by helping singles find a partner to begin their romantic journey. Yet when we helped two people find each other and develop a relationship they left Zoosk and there was no dedicated place online for them to share their romantic journey. Our new Couple Profiles offering provides couples with a place to share their romantic milestones and memories online in a joint profile that can be shared with friends. As we continue to develop Couple Profiles, we have plans to add many more features.? 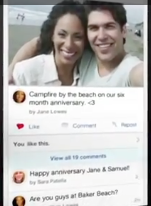 This makes a lot of sense as Facebook?s timeline also features these important relationship milestones, however not on a single profile. Watch their video to see the features of ?Couples Profiles? and feel free to chime in with your thoughts. Julie Spira is the leading online dating expert, bestselling author, and CEO of Cyber-Dating Expert. She creates irresistible profiles for singles on the dating scene. For more dating and relationship advice, like us at Facebook.com/CyberDatingExpert and sign up for our Weekly Flirt Dating advice newsletter. Follow @JulieSpira on Twitter.